The 4th century (per the Julian calendar and Anno Domini/Common era) was the time period which lasted from 301 to 400. In the West, the early part of the century was shaped by Constantine the Great, who became the first Roman emperor to adopt Christianity. Gaining sole reign of the empire, he is also noted for re-establishing a single imperial capital, choosing the site of ancient Byzantium in 330 (over the current capitals, which had effectively been changed by Diocletian's reforms to Milan in the West, and Nicomedeia in the East) to build the city soon called Nova Roma (New Rome); it was later renamed Constantinople in his honor. Eastern Hemisphere at the beginning of the 4th century AD. Eastern Hemisphere at the end of the 4th century AD. The last emperor to control both the eastern and western halves of the empire was Theodosius I. As the century progressed after his death it became increasingly apparent that the empire had changed in many ways since the time of Augustus. The two emperor system originally established by Diocletian in the previous century fell into regular practice, and the east continued to grow in importance as a centre of trade and imperial power, while Rome itself diminished greatly in importance due to its location far from potential trouble spots, like Central Europe and the East. Late in the century Christianity became the official state religion, and the empire's old pagan culture began to disappear. General prosperity was felt throughout this period, but recurring invasions by Germanic tribes plagued the empire from AD 376 onward. These early invasions marked the beginning of the end for the Western Roman Empire. In China, the Jin dynasty, which had united the nation prior in 280, began to quickly face troubles by the start of the century due to political infighting, which led to the opportunistic insurrections of the northern barbarian tribes (starting the Sixteen Kingdoms period), which quickly overwhelmed the empire, forcing the Jin court to retreat and entrench itself in the south past the Yangtze river, starting what is known as the Eastern Jin dynasty around 317. Towards the end of the century, Emperor of the Former Qin, Fu Jiān, united the north under his banner, and planned to conquer the Jin dynasty in the south, so as to finally reunite the land, but was decisively defeated at the Battle of Fei River in 383, causing massive unrest and civil war in his empire, thereby leading to the fall of the Former Qin, and the continued existence of the Eastern Jin dynasty. According to archaeologists, sufficient archaeological correlates of state-level societies coalesced in the 4th century to show the existence in Korea of the Three Kingdoms (AD 300/400–668) of Baekje, Goguryeo, and Silla. Contemporary bronze head of Constantine I.
Noba people settle in Africa. Early 4th century – Former audience hall now known as the Basilica, Trier, Germany, is built. 301: Armenia first to adopt Christianity as state religion. 306 – 337: Constantine the Great, ends persecution of Christians in the Roman Empire (see also Constantinian shift) and Constantinople becomes new seat of government (New Rome). 325 – 328: The Kingdom of Aksum adopts Christianity. 325: Constantine the Great calls the First Council of Nicaea to pacify Christianity in the grip of the Arian controversy. 335 – 380: Samudragupta expands the Gupta Empire. 337: Constantine the Great is baptized on his death bed. 350: About this time the Kingdom of Aksum conquers the Kingdom of Kush. 350 – 400: At some time during this period, the Huns began to attack the Sassanid Empire. 365: an earthquake with a magnitude of at least eight strikes the Eastern Mediterranean. The following tsunami causes widespread destruction in Crete, Greece, Libya, Egypt, Cyprus, and Sicily. Mid-4th century – Dish, from Mildenhall, England, is made. It is now kept at The British Museum, London. Mid-4th century – Wang Xizhi makes a portion of a letter from the Feng Ju album. Six Dynasties period. It is now kept at National Palace Museum, Taipei, Taiwan, Republic of China. 376: Visigoths appear on the Danube and are allowed entry into the Roman Empire in their flight from the Huns. 378: Battle of Adrianople: Roman army is defeated by the Visigoth cavalry. Emperor Valens is killed. 378 – 395: Theodosius I, Roman emperor, bans pagan worship, Christianity is made the official religion of the Empire. 378: Siyaj K'ak' conquers Waka on January 8. 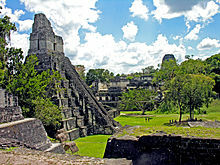 378: Siyaj K'ak' conquers Tikal on January 16. 378: Siyaj K'ak' conquers Uaxactun. 381: First Council of Constantinople reaffirms the Christian doctrine of the Trinity by adding to the creed of Nicaea. 383: Battle of Fei River in China. 395: The Battle of Canhe Slope occurs. 395: Roman Emperor Theodosius I dies, causing the Roman Empire to split permanently. Late 4th century – See "The Historia" of Arbogast and Bauto. Late 4th century – Cubiculum of Leonis, Catacomb of Commodilla, near Rome, is made. Late 4th century – Atrium added in Old St. Peter's Basilica, Rome. Albia Dominica, Roman Empress and regent (c. 337-after 378). Arbogast, Roman general and rebel (d. 394). Bassianus, Roman candidate for the position of Caesar (d. 316). Calocaerus, Roman usurper (d. 334, reigned 333-334). Claudius Silvanus, Roman general and usurper (d. 355, reigned 355). Constans, Roman Emperor (c. 323-350, reigned 337-350). Constantina, Roman Augusta (between 307 and 317 - 354). Constantine the Great, Roman Emperor (272-337, reigned 306-337). Constantine II, Roman Emperor (316-340, reigned 337-340). Constantius Chlorus, Roman Emperor (c. 250-306, reigned 293-306). Constantius II, Roman Emperor (317-361, reigned 337-361). Constantius Gallus, Roman Caesar (c. 325/326-354, reigned 351-354). Crispus, Roman Caesar (between 295 and 305- 326, reigned 317-326). Dalmatius, Roman Caesar (d. 337, reign 335-337). Decentius, Roman usurper (d. 353, reigned 350-353). Diocletian, Roman Emperor (244-312, reigned 284-305). Domitius Alexander, Roman usurper (died c. 311, reigned 308-311). Eugenius, Roman usurper (d. 303/304, reigned 303-304). Eugenius, Roman usurper (d. 394, reigned 392-394). Eutropius, Roman politician, chief advisor to the emperor (d. 399). Firmus, Roman usurper (d. 375, reigned 372-375). Gainas, Roman magister militum, briefly seized control of Constantinople (d. 400). Galerius, Roman Emperor (c. 260-311, reigned 293-311). Gildo, Roman general and rebel, instigator of the Gildonic War (d. 398). Gratian, Roman Emperor (359-383, reigned 367-383). Hannibalianus, Roman politician, King of Kings, candidate for the throne of a restored Kingdom of Pontus (d. 337). John Chrysostom, Syrian-born Patriarch of Constantinople. Jovian, Roman Emperor (331-364, reigned 363-364). Julian, Roman Emperor (331/332-363, reigned 360-363). Justina, Roman Empress and regent (c. 340-c. 388). Licinius, Roman Emperor (c. 263-325, reigned 308-324). Licinius II, Roman Caesar (c. 315-326, reigned 317-324). Magnentius, Roman usurper (303-353, reigned 350-353). Magnus Maximus, Roman Emperor (c. 335-388, reigned 383-388). Marcellus, Roman usurper d. 366, reigned 366). Martinian, Roman Emperor (d. 325, reigned 324). Maxentius, Roman Emperor (c. 278-312, reigned 306-312). Maximian, Roman Emperor (c. 250-310, reigned 285-305, 306-308, 310). Maximinus II, Roman Emperor (c. 270-313, reigned 305-312). Nepotianus, Roman usurper (d. 350, reigned 350). Procopius, Roman usurper (c. 325/326-366, reigned 365-366). Valerius Romulus, Roman consul, son and heir to an emperor (c. 292/295- 309). Rufinus, Roman politician, Praetorian prefect of the East, power behind the throne of the Eastern Roman Empire (d. 395). Salutius, Roman politician, Praetorian prefect of the East, candidate for the imperial throne. Flavius Severianus, Roman politician, son and heir to an emperor (d. 313). Executed for allegedly trying to become a usurper. Flavius Valerius Severus, Roman Emperor (3rd century-307, reigned 305-307). Theodorus, Roman usurper (reigned c. 372). Theodosius I, Roman Emperor (347-395, reigned 379-395). Valerius Valens, Roman Emperor (d. 317, reigned 316-317). Valens, Roman Emperor (328-378, reigned 364-378). Valentinian I, Roman Emperor (321-375, reigned 364-375). Valentinian II, Roman Emperor (371-392, reigned 375-392). Valentinianus Galates, Roman consul, son and heir to a Roman Emperor (366-c. 370). Predeceased his father. Valentinus, Roman rebel (d. 369). Varronianus Roman consul, son and heir of an emperor (c. 363-after 380). Bypassed for the succession and partially blinded. Vetranio, Roman Emperor (died c. 356, reigned 350). Flavius Victor, Roman Emperor (d. 388, reigned 384-388). Ge Hong, Chinese official and writer. Augustine, Christian theologian, bishop of Hippo. Ambrose, Christian theologian, bishop of Milan. Basil the Great, Christian theologian, bishop of Caesarea in Cappadocia. Lactantius, Christian theologian, advisor to Constantine I.
Mesrop Mashtots, (c. 361–c. 440), Armenian monk, theologian and inventor of the Armenian alphabet. Theodore, Christian theologian, bishop of Mopsuestia. Ulfilas, Arian priest and translator of the Bible into Gothic. ^ The Long Fourth Century 284-450: Continuity and Change in the Later Roman Empire ed. S. McGill, C. Sogno and E. Watts (Cambridge 2008). ^ "The Maya: Glory and Ruin". National Geographic Magazine. ^ Roberts, J: "History of the World". Penguin, 1994. ^ "The Austronesians: Historical and Comparative Perspectives". ANU Press. ^ Lee, Adela C.Y. "The stirrup and its effect on chinese military history". Silkroad Foundation.